Some of us know Craig Carter as a consummate, education professional dedicated to improving the performance of academics in the state. As the KEA Director for Kentucky's first district, he spends his weekdays in the halls and offices of our school systems, assessing and fixing problems, moving the education of our children forward. On the weekends, however, you're more likely to find him wearing a rhinestone suit and singing his heart out in a Nashville honky tonk. "I've been in Nashville and run into parents and superintendents who have no idea that I sing, and they are more than surprised," laughs Craig. "I saw a couple of parents come into a place where I was performing, and when they saw me on stage, they froze! Their jaws dropped open, and all they could say was, 'Mr. Carter?!'" Performing is not new for Craig. The Marshall County native has been singing his whole life and performing since he was eight years old at talent shows and the Kentucky Opry. He was even invited by Porter Waggoner to sing at Opryland after winning a Nashville contest. He's managed, until now, to keep that side of himself fairly secret in Paducah. "It really is therapy for me," says Craig. "I work hard all week, and on the weekends I can escape through songwriting and performing. It's one of my favorite things in order to get away and sort of transform into something different." 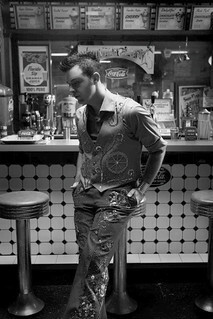 Craig describes his style as rockabilly, rooted in the lofty sounds of Sun Records in the 1950s. Sometimes similar to early Elvis recordings, it is deeply entrenched in the burgeoning days of country music, often showcasing the sound that developed when country met rock and roll. "Sounds from the past stir my soul," he says. "As an artist, I am compelled to share that music with a new generation." On his most recent album, Master of Disguise, he sings arrangements of songs by some of his heroes. There's You Win Again and Take These Chains From My Heart by Hank Williams, Sr. Craig also performs The Grand Tour and He Stopped Loving Her Today from George Jones. Peppered among renditions of his favorite songs are Craig's originals such as Master of Disguise. "That one's about a past relationship. It's a typical cheater song," laughs Craig. His song Jesus Loves Me begins much as one would expect, but takes a decidedly country turn. As an organ softly plays, Craig's voice enters: "Yes, Jesus loves me. Yes, Jesus loves me. Yes, my Jesus loves me. But nobody else gives a damn!" "I do like to write lyrics that are shock factors," says Craig. "That one goes over well in Nashville!" And it's in Nashville where Craig spends most of his time. He plays at places like the Bluebird Cafe, Wildhorse Saloon, Nashville Palace, Tootsies, and others. He rounds out his songs with an onstage persona that is often decked out in Nudie Cohn designed attire. He did a lot of western outfits for country stars," he says. "Porter Wagoner was known for wearing suits from Nudie. He even designed Elvis Presley's famous gold suit. So maybe it's the antique collector in me, but I am always on the lookout for his clothing. And it really does pair well with the music." With every performance, Craig's heart is into every song. "It is a chance to stir and instill emotion," he says. "I loved using music in the classroom, and I still have former students mention that to me. They'll say things about the songs I'd sing. That means it had an impact. I want to continue having that kind of effect."